On Monday afternoon, I got to meet Claudine, the young woman I had sponsored the sewing machine for when she graduated sewing class. Claudine is a beautiful young woman, very quiet, with a small child. She was thrilled that she now had a sewing machine to make clothes not only for her family, but to sell. We visited at her home and met her husband. He seemed like a kind, gentle young man. He thanked me over and over for what I had done. Claudine presented me with a beautiful quilted bag that she had made for me to thank me. They offered us the customary bananas, then he prayed before we left their home. Tuesday. We went to Fumbwe sewing center, and then Laura and I delivered a few mattresses that were donated to a few of the women. One woman said it was the very first mattress that she had EVER slept on. Oh, the things we take for granted…. I also got to meet Godance. 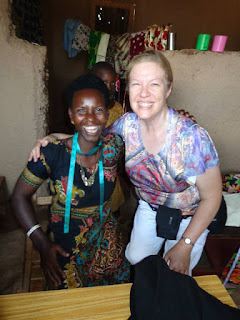 I had seen a picture of Godance a few months ago as she graduated from a sewing class. She has been a BIG motivation to me because she is a young crippled lady and walks with two canes. Godance wanted to learn to sew so bad that she walked two hours to get to the sewing class every day. What an inspiration! We met with Godance at her home and she was thrilled to get to meet me! We even compared our leg braces!! Godance is crippled and uses two canes to walk. and now can make clothes to sell for income. We were comparing our leg braces. 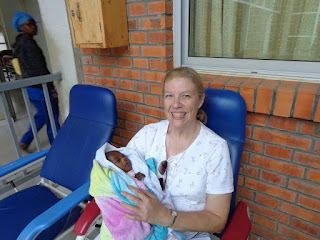 That afternoon, we went up to the hospital in Masaka. Laura, Randall, and Jennifer routinely go up to this hospital, bring small gifts to the patients, and pray with them. Most of the patients truly wanted the prayers. I noticed that the hospital didn’t seem very clean, with patients lying on dirty sheets. Laura told me that the people had to bring their own sheets. Next we visited with baby Grace in the hospital. She is a newborn that had been abandoned. She had a mark on her head, as if her mother had tried to kill her, and is somewhat delayed mentally. Laura and Jennifer take turns going to visit her and exercise her legs and arms. They also bring clean clothes and blankets for her. As I was getting tired by now, Laura suggested that I sit in a chair with baby Grace and rest for a while. So, I sat and rocked Grace. I sang “Jesus Loves Me” to her and any other songs that came to mind. I noticed that I had a number of women coming by and staring at me. I guess it looked unusual for a white woman to be rocking an African baby! Jennifer said I looked like a “Grandma” there! Well, I’ve had lots of experience with that…. On Thursday, we took a two and a half hour ride up into the mountains to the Akagera National Park. It seemed we were one of the only people there. It was beautiful up there, with its mountains and savannahs. We started out driving in our little Toyota car, but it started to rain. The dirt roads turned slick immediately and we slid around as if we were on black ice. We did manage to see many monkeys, zebras, warthogs, several species of birds including an eagle, a large crocodile, and a hippo who decided to duck under the water just as I was taking his picture! Friday, I was terribly tired, so we decided to stay home that morning. We were having a party for all the children that I had sponsored that afternoon. We set out bananas and breads for them. The children showed up and we fed them. Laura had brought some games, so the children were taught to play Memory and make puzzles. I have to say that the Rwandan people really concentrate at everything they do, even games. There is no fighting or arguing when someone wins. They all get along. If only our American children were like that! We went outside with some bubbles that Laura had brought, which were a BIG hit! 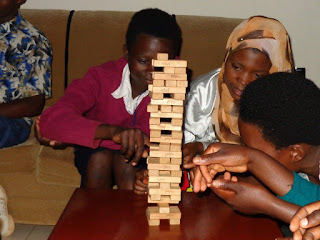 On my last day, Saturday, we once again went to the Children’s Bible Club in Masaka. Laura brought the bubbles along, which these children had never seen. Oh, what FUN!! The children were THRILLED as I continued to blow bubbles for them to catch! 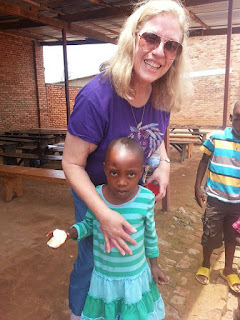 As Laura went on with their Bible stories, I had two children, one new little child and one of my sponsored students (whose name was DARLENNE) sitting next to me. They cuddled up closely to me as if we had known each other for years. Oh, how my “hug tank” was filled in Rwanda…. I just finished reading all of Darlene's stories. Tears are STREAMING down my face, and I am "ugly crying". How God has mightily used her! From being allowed to sponsor not just one child but FOURTEEN, to the way her personal story resonated with the widows of the villages, God never ceases to amaze me with His Plan for us. I am certain, beyond any doubt, that when Darlene dies and leaves this earth, she will be given one of the most beautiful crowns Jesus has at his disposal, and her heavenly mansion will eventually be filled with the Rwandan women and children she touched. Thank you Jesus for Darlene, and may the Father continue to bless her abundantly, along with the women and children she has touched. In Christ's precious name, Amen! Amen, Kelly! And now you've got me searching for the kleenex. ..
Amen to everything Kelly said.